This morning you will be collected from your Nairobi hotel and taken to the departure point for your group adventure tour, travelling in a rugged 4x4 overland truck. We then travel 4-hours to Arusha in neighbouring Tanzania. We check into our accommodation in this town in the northern highlands, situated beneath the twin peaks of Mount Meru and Mount Kilimanjaro and formerly an administrative centre in German East Africa. You will have the afternoon at leisure to explore the town. Today we set out in a 4x4 game viewing vehicle and drive 4-hours to the great Serengeti, erecting our dome tents before enjoying an afternoon game drive. Serengeti National Park (meaning 'Endless Plains) is a World Heritage site that hosts the largest overland wildlife migration in the world. Each October over 2 million wildebeest and accompanying wildlife travel over 500 miles, as they journey from the open plains of the Masai Mara and across the hills of the Serengeti to the southern plains. After calving in February, from April onwards the great migration starts once again as these millions of animals move northwards, crossing the treacherous Grumeti River in the western corridor in search of the sweet new grasses of the Mara. Check into your lodge in this magnificent wildlife area. Today is devoted to Big Five game viewing in the great Serengeti National Park, with predators at their most active in the early morning and late afternoon. This morning we leave Serengeti and drive 3-hours to the Ngorongoro Crater. Stretching across 8,300 sq km, the high altitude Ngorongoro Conservation Area boasts a dramatic variety of volcanic landscapes, wildlife, people and archaeology. Its grasslands, waterfalls and mountain forests are home to an abundance of animals and also to the Masai people, and has been declared a World Heritage site. In the afternoon we drive down into the basin of the Ngorongoro Crater, the world's largest intact caldera forming a spectacular bowl of about 265 square kilometres with sides up to 2,000 feet (600m) deep. Although animals are free to move in and out of this contained environment, the rich volcanic soil, lush forests and spring lakes on the crater floor attract both grazers and predators all year round, with up to 30,000 animals living in the crater - the highest density of big game found anywhere in Africa - including endangered black rhino, lion, hyena and jackal on the open savanna and elephants and monkeys in the forests. You may also see flamingos on the lake. Today we travel 4-hours back to Arusha and meet up with our overland truck. Check into your accommodation in this regional capital. A full day on the road today, as we leave Arusha and travel to Bagamoyo. Formerly the capital of German East Africa, this town was at the centre of the important trade route that linked Lake Tanganyika with the sea. Bagamoyo means "throw down your heart" as slaves were imprisoned here before being sold in the markets of Zanzibar - along with salt, ivory, fish and many other commodities. Many famous European explorers, including Henry Morton Stanley and David Livingstone, started and ended their trips here. Check into your accommodation and relax close to the warm Indian Ocean. Today we travel 2-hours to Dar Es Salaam and take the ferry to Zanzibar Island, where you will be met and transferred to your beach accommodation. Lunch is not included in Zanzibar and you have the option of eating out. At leisure to relax on the warm golden Indian Ocean beaches of Zanzibar. Optional activities include snorkelling, diving, fishing, turtle sanctuary visit, Jozani forest or village tour. Lunch is not included in Zanzibar, where you have the option of eating out. Today transfer 1-hour to the island capital of Stone Town. This UNESCO World Heritage town is now part of the Republic of Tanzania, but it was formerly controlled by the Sultan of Oman. As such it was an important trading nation, selling spices and other commodities to Europe, the Middle East and Asia. It was also at the centre of the notorious slave trade out of East Africa. This Muslim city is today rather neglected and not what it once was, but most people still enjoy walking through the narrow streets of the historic old city. The merchant's houses are of particular interest, with their central courtyards and large ornately carved and studded wooden doors. You can visit the bustling market, see some of the many mosques and admire the huge Anglican Cathedral built on the site of the former slave market, where the slave pits and dungeon can still be seen. Other sights include the Arab Fort, the Palace Museum and Dr Livingstone's house. This morning we explore the historic area of Stone Town before taking the ferry back to Bagamoyo. Meet up with your overland truck and check into your accommodation. Today we leave the coast and travel inland to Mikumi National Park, which forms part of the Greater Selous wildlife conservation area. After checking into our accommodation, there is an optional afternoon game drive into this vast national park which supports huge herds of plains game such as zebra, wildebeest, buffalo and elephants, as well as predators such as lion that follow them. We continue travelling southwards and further inland today, as we head for Iringa in the highland tea-growing region of the magnificent Great Rift Valley. Enjoy the highlight of an included traditional dinner tonight. Today we leave Tanzania and travel southwards towards Karonga situated on the northwestern shores of Lake Malawi, regarded as one of the most beautiful lakes in the world. We ascend out of the Great Rift Valley through some spectacular mountain passes, passing vast tea plantations in the highlands before arriving at our accommodation overlooking this magnificent freshwater lake. Originally named Lake Nyasa when discovered by David Livingstone (who also nicknamed it the "Lake of Stars" due to the many lanterns of fisherman at night), this is the third largest lake in Africa and the southernmost lake in the Great Rift Vally system, bordering both Mozambique to the east and Tanzania to the north. Enjoy snorkelling amongst aquarium fish and swimming in crystal clear waters, which hold more different species of fish than any other body of water on earth. Bird watching is also outstanding. It may also be possible to book an excursion to the Livingstonia Mission (full day hike). We continue travelling southwards today along the shores of Lake Malawi to Ngali Beach. If time permits, enjoy snorkelling in the crystal clear waters and discover more of the interesting marine life of this magnificent freshwater lake. Another day free to relax on the shores of beautiful Lake Malawi. We leave Lake Malawi early this morning and drive into Zambia, continuing to the famous South Luangwa National Park. South Luangwa is Zambia’s most famous wildlife park, covering an area in excess of 5,600 square miles (9,050 square kilometres). Sustained by the great Luangwa River the park hosts a wide variety of wildlife, birds and vegetation. The changing seasons add to the park’s richness, ranging from dry bare bushveld in the winter to a lush green in the summer in this pristine wildlife wilderness. Game is most easily sighted in the dry season from April to October, but the park is at its most beautiful in the first half of the year after the rains of the wet season. Check into your accommodation in this renowned wildlife wilderness, before setting out in the late afternoon on a sunset game viewing drive. You can often see hippos and other animals from the camp bar. This morning you have the opportunity to take an extra optional game drive or walking safari in this great conservation area. With over 60 different animal species, the concentration of game around the Luangwa River and its ox bow lagoons is amongst the highest in Africa, including four of the Big 5 – lion, elephant, buffalo and leopard (sadly rhino has been poached to extinction). Also search for zebra, giraffe, antelope and much more, with leopard sightings being particularly outstanding. Birding is also outstanding with over 400 different species, including large flocks of cranes. From late August to October you can enjoy the amazing spectacle of thousands of southern carmine bee-eaters nesting along the river banks. From November numerous migratory birds start to arrive to exploit the feeding opportunities presented during the warm rainy season - including red chested cuckoo, hobbies and birds of prey such as steppe buzzards that travel from as far afield as Russia. After lunch, we visit a community-run tribal textile project to see craftsmen at work (note: the production factory is closed from December to March, but the shop is open all year round). In the evening relax by the campfire under a balmy African sky and hear the untamed sounds of wildlife all around. We leave South Luangwa National Park today and travel through Chipate in eastern Zambia, towards Petauke. On arrival we check into our accommodation, with balance of day at leisure to relax in this beautiful country with its lush sub-tropical vegetation. We journey towards the bustling Zambian capital of Lusaka today. On weekdays there may be the opportunity to visit one of the local markets, before we arrive at our accommodation in the city. Today we travel from Lusaka to Livingstone, and cross the Victoria Falls Bridge into Zimbabwe. After completing immigration formalities, check into your accommodation in Victoria Falls. Check in, settle in and relax whilst you catch your first glimpses of the magnificent Smoke That Thunders first discovered by Dr. David Livingstone and still one of the greatest natural wonders of the world. The flow of water over the Victoria Falls is greatest from February to June following the summer rains, but they are a magnificent sight at any time of year. At leisure to relax and explore on foot the mighty Victoria Falls and its rainforest (we suggest you take your own rain jacket, as those on hire are often well used). Many optional activities are available, including a Sunset Cruise on the Zambezi River to see hippos, crocodiles and the abundant bird life. 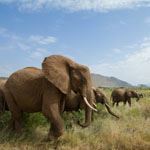 You can also enjoy an optional elephant-back safari, a helicopter flight over the falls, or white water rafting in the turbulent gorge below the falls. You can even bungy jump off Victoria Falls bridge! We depart from Victoria Falls today and travel 2-hours to the Botswana border at Kasane. After completing immigration formalities, we continue to our accommodation situated on the banks of the Chobe River. In the late afternoon a special highlight is an included Game Viewing Sunset Cruise on the Chobe River. Game viewing opportunities should present themselves almost immediately in this vast game sanctuary and hopefully you will see elephant, buffalo, zebra, wildebeest, antelope and other river-based wildlife. Later dine overlooking the river in the atmosphere that only the African bushveld can provide. After an early morning game drive in Chobe National Park, we travel to Nata situated near the northern reaches of the Makgadigadi Pans. These white shimmering pans are one of the largest salt flats on earth, covering over 6,000 sq.miles (16,000 sq.km) - with some covered in water during the wet season. On our journey today, a portion of our route bisects the Nxai Pan and Makgadigadi National Parks, so if we are fortunate we may see some of the wildlife that roams this vast protected area. The road from Nata is lined with majestic baobab trees and we will catch glimpses of the extensive pans that stretch out to the south. Heading out early today, we travel 1-hour to the Okavango Delta to explore the beauty and serenity of this intricate system of lily covered channels and lagoons by mokoro canoe. The seasonal Okavango Delta is flooded annually by the Okavango River, which flows inland from Angola into the dry sands of the vast Kalahari – never finding the sea, but instead forming a huge inland delta whose waters are absorbed by the desert. We set off before dawn this morning and drive to Moremi Game Reserve, situated along the eastern shores of the Okavango Delta and offering superb land-base game viewing. We search for some of the larger species that inhabit this natural oasis in the middle of the Kalahari, with its vast array of wildlife and birds of all descriptions. Here you can hope to see big game such as elephants, buffalo, lion, zebra, wildebeest, red lechwe, wild dogs, cheetah, leopard and hippo - as well as over 240 different bird species. Today we leave Maun and travel to Ghanzi in the Central Kalahari. The San Bushmen have existed here for thousands of years, in some of the harshest conditions. These nomadic hunter-gatherers have passed down a rich knowledge of the plants and animals that play such an important part in their lifestyle. Tonight we get a first-hand experience of the San culture, well known for its rich traditions of song, dance and story-telling. This morning we enjoy a guided walk with our San guides who will introduce us to the many secrets of their survival in the Kalahari Desert. We then make our way along the Trans-Kalahari Highway towards the remote town of Kang. We will travel slowly along this stretch of unfenced road, which could provide the odd sighting of wildlife in its natural environment. Leaving the Kalahari behind us, a long day awaits as we continue our journey southwards across the North West Province to Johannesburg in South Africa. Our tour ends in Johannesburg in the late afternoon, with optional farewell barbeque together (pay locally).